Dip your toe into the waters of the latest Bilge Rat Adventure: The Sunken Curse. Thanks to the hard work of vigilant pirates, the number of Gunpowder Skeletons plaguing the Sea of Thieves has lessened, so the Bilge Rats have turned their enterprising eyes to something sinister twinkling beneath the waves. Will you take up the challenge? The Sunken Curse is the latest Bilge Rat Adventure ready to be tackled by venturesome seadogs and scallywags. Step off your ship and take a dip into the sea, as Cursed Mermaid statues beckon you with mysterious murmurs. They may look beautiful and valuable, but you must do whatever it takes to destroy them and break their curse! Test your mettle – or metal, as your cutlass will come in handy here – and show those Bilge Rats how capable a curse breaker you are. What’s in it for you? 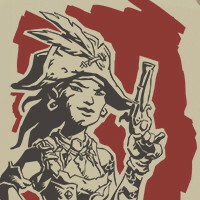 Commendations and Titles, as well as Doubloons which you can exchange for gold, Trading Company reputation or brand new time-limited Bilge Rat cosmetics. You may also discover treasures lying in wait on the sea bed! Up for grabs this time is the Wailing Barnacle set. With its arthropodal and coral detailing, adorning yourself with this will help you cut the figure of a pirate who isn’t afraid to get their hands and hooks wet. You’ve got until July 25th to earn all the Doubloons possible for this Bilge Rat Adventure, so go seek out Duke in any tavern to get yourself started. You can find more details on The Sunken Curse in this week’s Patch Notes. See you out there!